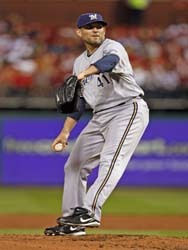 The Milwaukee Brewers today declined the 2010 mutual option on right handed pitcher Braden Looper. Looper went 14-7 in 2009, but he had a rather robust 5.22 ERA in 34 starts. He set a franchise record with 39 home runs allowed, which also led the majors. Looper also led the league in runs allowed (123) and earned runs allowed (113). In other Brewers news, infielder Craig Counsell and pitcher David Weathers both elected free agency. The Brewers 40-man roster now stands at 35.